Words that encapsulate the warm, fuzzy feelings that surround the height of fall and transition into the holidays: footie pajamas; hearth; hot chocolate; mittens; Apple Cranberry Turkey Meatballs. If Thanksgiving were a meatball, it would be an Apple Cranberry Turkey Meatball. Sweet, juicy, and tangy, these turkey meatballs take the ingredients and flavors I most associate with family holiday gatherings and pack them into a single, melt-in-your-mouth bite. The crowd at Wine & Dine Wisconsin for whom I cooked them live agreed! Aside from the fact that cranberry sauce should be handled with caution when wearing a white chef’s coat, I could not have selected a more perfect recipe to make for a crowd, whether that crowd happens to be sitting a few feet away watching you cook live as they were for me, or is a hungry crew that’s gathered in your home for a holiday party or game watch. 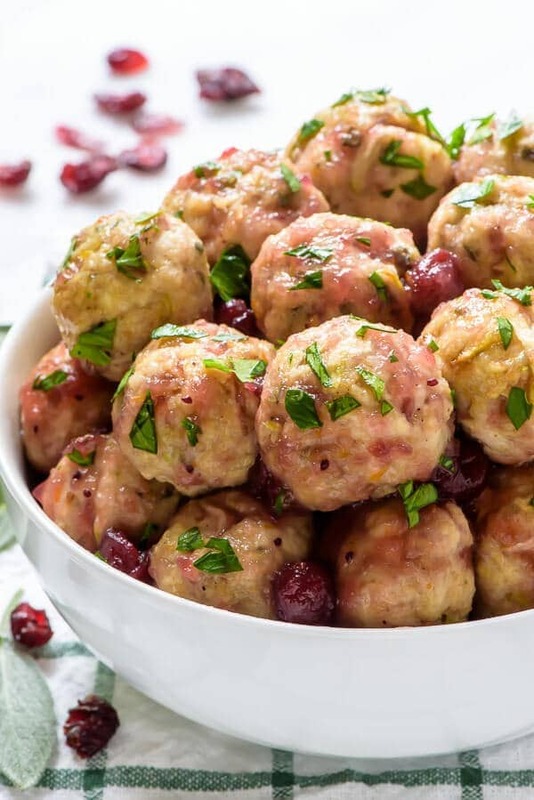 The ingredients in these cranberry turkey meatballs are few but the flavors are profound, and, as I promised my skeptical on lookers, they are some of the juiciest meatballs you will ever taste. My secret to turkey meatball moisture supremacy? Shredded apples. Blended with the ground turkey meatball base, the apples lend their juiciness to the meat, which makes the meatballs super tender, and their light sweetness is a lovely addition too. Chopped fresh sage, a classic ingredient in both stuffing and roast turkey, gives the turkey meatballs a warm, savory flavor that I immediately associate with holiday meals and satisfied appetites. To dress the meatballs, I stirred together an easy cranberry sauce that’s a perfect tart counterpoint to the sweet apple. While the sauce tastes 100% scratch made, I have a secret shortcut: canned whole cranberry sauce. Stirred together with fresh orange zest and juice, unsweetened apple sauce, and a touch of maple syrup, the canned cranberries are transformed into a boss turkey meatball sauce that tastes like it took hours, instead of mere minutes. 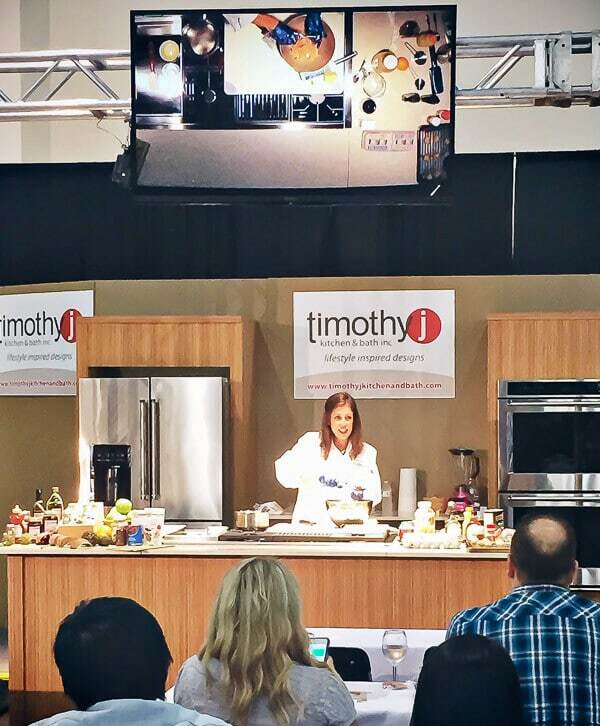 After demoing the recipe for my Wine & Dine audience, I waited anxiously while the cranberry turkey meatball samples were passed to attendees. While I’d been cooking the meatballs on stage, a group of talented culinary students from the Milwaukee Area Technical College had been ferociously prepping them behind the scenes to pass to the hungry crowd. I held my breath during the first bites, then couldn’t help but grin myself as the smiles and thumbs-up spread through the crowd. Turkey meatball victory! I owe this special opportunity to cook at Wine & Dine to my wonderful local partner, Pick ‘N Save. I’m proud to work as a brand ambassador for the grocery store where I shop daily and of the fact that Pick ‘N Save supports the Milwaukee community. 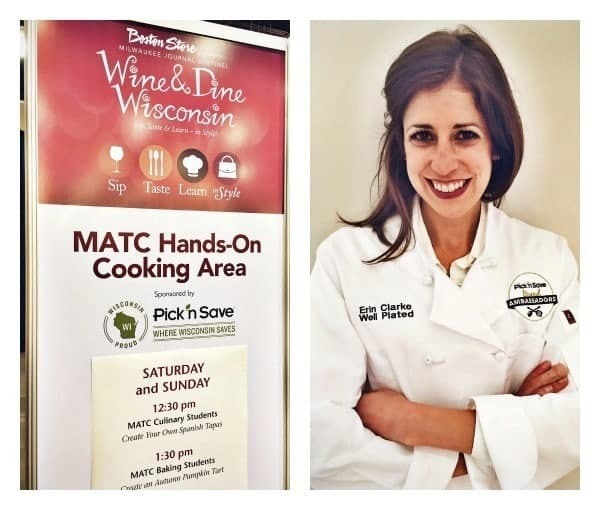 The company was a key event sponsor of Wine & Dine, and it also sponsors a culinary student to attend MATC. So cool! I made the meatballs using Pick ‘N Save Roundy’s store-brand products, which I’ve found to be just as good as their name-brand counterparts, at a fraction of the price. That’s me, sporting my sweet Pick ‘N Save chef coat. I even managed to keep it clean while stuffing cranberry turkey meatballs into my face immediately after the crowd cleared. Can you blame me? Just look at these juicy babies! 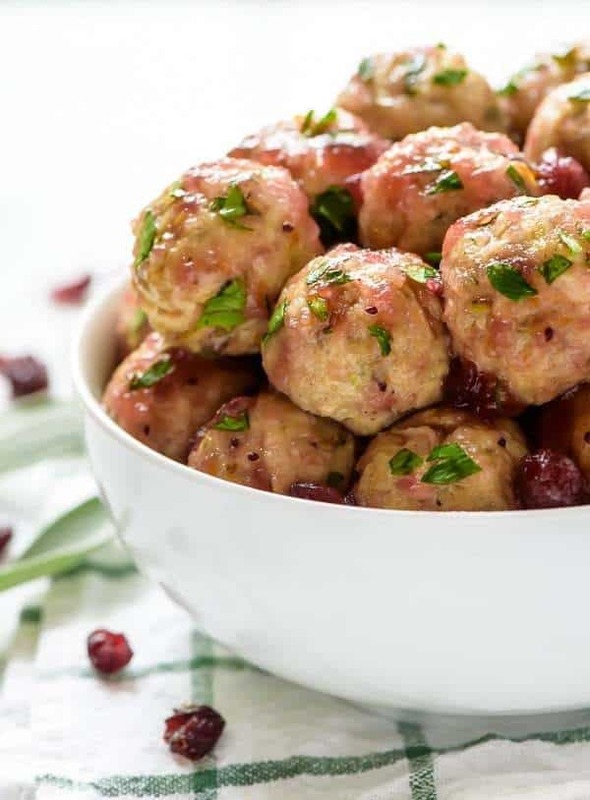 Whether you serve them as a holiday appetizer, game-day bite, or main course with a side of couscous or rice, these Apple Cranberry Turkey Meatballs are sweet and sassy satisfaction guaranteed. A few meatball tips: Don’t skip the baking rack! Baking these meatballs on a baking rack set on top of a baking sheet elevates them slightly to ensure even cooking on all sides. I also like using a small cookie scoop to shape the meatballs so that they are all uniform in size and bake at the same rate. Make this recipe in a slow cooker: Once the meatballs are made, you can transfer them to a slow cooker to keep warm. This is a great option for parties and to free up stove space. I’ve owned this 6-quart programmable slow cooker for years and absolutely love it. 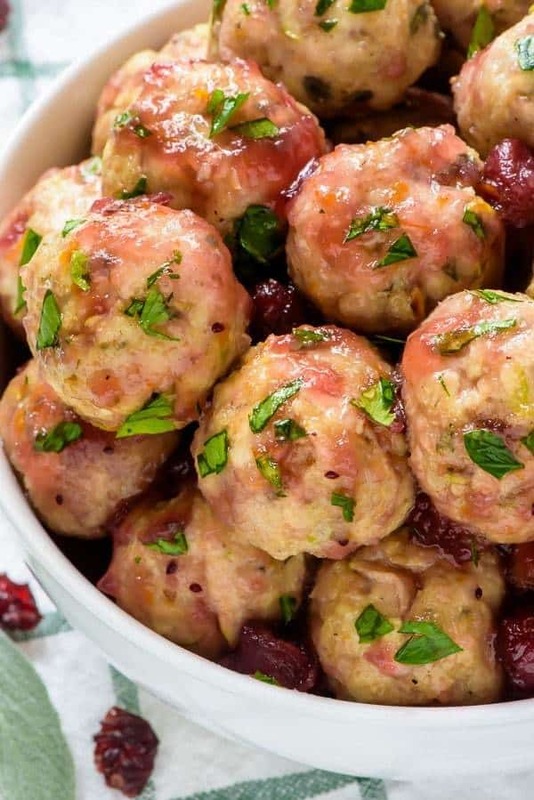 Super moist cranberry turkey meatballs with apples and sage. With holiday flavors, this recipe is perfect for Thanksgiving or any holiday party! Place a rack in the center of your oven and preheat the oven to 425 degrees F. Place an ovenproof baking rack on top of a large, rimmed baking sheet, then lightly coat with cooking spray. Set aside. In a large mixing bowl, combine the turkey, breadcrumbs, olive oil, egg, apple, sage, garlic powder, onion powder, salt, and pepper. With your hands or two forks, lightly mix to combine, being careful not to compact the meat. Roll the mixture into 1 1/2 to 2-inch balls, using a small scoop to help portion as desired. Arrange the meatballs on top of the prepared baking rack. Bake in the oven for 12-14 minutes, just until cooked through. Meanwhile, prepare the sauce: In a saucepan large enough to hold the meatballs, combine the cranberries, applesauce, maple syrup, orange zest, and orange juice. Heat over medium to warm through. Add the cooked meatballs to the sauce, then spoon the sauce over gently to coat. Transfer to a serving platter to enjoy immediately or place in a slow cooker set to the lowest heat to keep warm. Garnish with fresh parsley as desired and serve. I am sharing this post in partnership with Pick ‘N Save, for whom I am honored to be a brand ambassador. Thanks for supporting the brands and companies that make it possible for me to continue providing quality content to you! Oh wow these not only look amazing they sound divine. I actually sighed when I read they have grated apple in – total game changer. I Kew they were going to be good but grated apple sends these meatballs completely over the top. I’d have to leave out the Orange (allergic) but I still can’t wait to make these. I can only hope they are as good as yours. Completely in awe Sammie. Thank you so much Katherine! It was such a neat day. I really appreciate your sharing the recipe too! Hi Martha! Regarding nutritional info, this is something that I’ve actually started adding to all of my new recipes, effective January 2016 (you’ll see it in the recipe box at the bottom). Unfortunately, it’s pretty time consuming, so I’m unable to go back and add it to past recipes. If you’d like the nutritional info for any of my older recipes (or really any other recipe or food), you can actually calculate it yourself for free at myfitnesspal.com (this is how I calculate the new recipes on my blog). I’m sorry I can’t give you the information for this specific one, but I hope that My Fitness Pal will be a helpful resource for you. These meatballs are genius!! I never thought of using shredded apple to make them moist!! I would love to make these for thanksgiving, every one would go crazy over them! So incredibly good meatballs! Love the combination of apple, cranberries and turkey! Yummy! 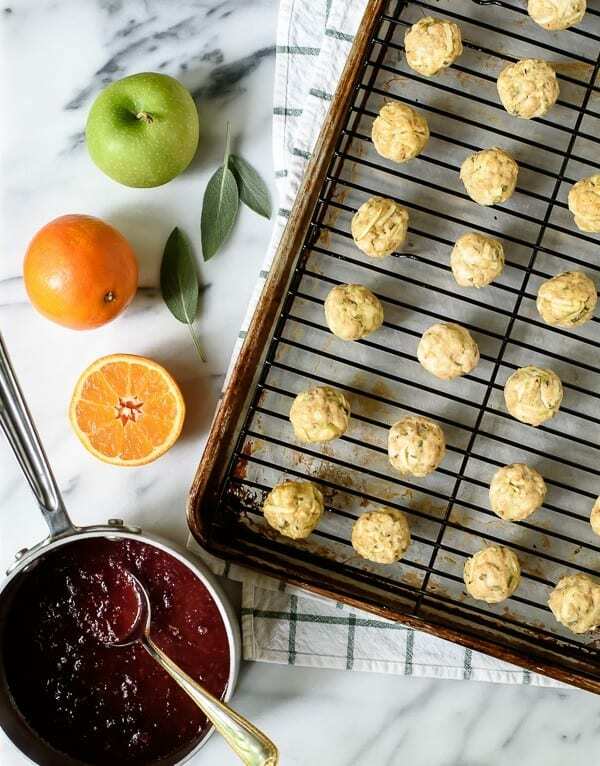 These meatballs are such an ingenious new spin on the classic apple+cranberry combination! They look positively droolworthy. They’re going on my must-make list! These flavors together scream HOLIDAYS, I love it!!! And these look so darn JUICY. Pinned and stopping at the store for the ingredients I need, making these soon!!! These meatballs sound great – like something I will make for Thanksgiving if we stay home this year. They are much easier than what I made last year. I’m hoping we do stay home, since where we would go is an 8.5 hour drive each way, which is very tiring, and we just did that trip this weekend. I’m curious what you would choose to serve these with. Susan, I’m so glad you like the sound of these! As an appetizer, I’d serve them plain (just using toothpicks), but for a main I might try them with wild rice or whole wheat couscous with a side of green veggies. I hope you enjoy the recipe! how would you serve them cold as an appetiser? Could you just use the sauce as a cold dipping sauce? Thanks, Erin! I love the idea of a simple meal like what you suggested. I would be serving this as a main dish. So creative girl! These do look good! I read this post yesterday and couldn’t get it out of my head! I didn’t quite have enough time to make them last night, but it did inspire me to attempt a ground turkey, cranberry, nutmeg risotto, which was great! Thanks for the inspiration, and I can’t wait to make these for my crowd! They’ll go nuts over them! Pinned and Yummed! Your risotto sounds dreamy Heather! I’m so happy this recipe inspired you. Thank you! These are AMAZING! I just made them and paired them with stuffing. Oh my. I am in heaven. This will be my go to holiday recipe as I am an “orphan” and don’t need big meals. Thanks so much! Hooray!!!! I’m so happy to hear that Stacy. Thanks for trying the recipe and letting me know how it turned out. It really means a lot! Made these excellent meatballs today for the first time. I think it is the cranberry sauce that makes them so special. The cranberry’s also add color to these very low calorie but tasty meatballs. The orange Zest also adds a lot of flavor in these meatballs. I would rate this recipe 5 stars. Keep up the good work Erin. I for one will be watching your recipes closely. I am diabetic and always looking for tasty low calorie recipes. Arthur, I’m so excited that you enjoyed these, and I love the cranberry sauce with the orange zest too! Thanks so much for trying the recipe and for letting me know how it turned out. I hope you love the other recipes you find too! I made these meatballs for an appetizer for our family Christmas Eve celebration. Instead of the cranberry sauce, I used cranberry chutney I previously made. These were an absolute hit – tender, moist and tasty. Kids and adults alike love them! Will definitely keep this recipe and make again for another get together soon. Margie, I am so happy to hear this, and I bet the meatballs were fantastic with your cranberry chutney! I’m honored that this recipe was a part of your Christmas Eve. Happy Holidays, and thank you so much for letting me know how the recipe turned out for you. Simply divine….the cranberry sauce is so yummy…..such a nice change from the standard italian…I make them in larger batches to freeze and to share…. Hi Mary! I don’t have the nutritional info for this recipe, but you calculate it (and any other recipe) for free at myfitnesspal.com. I hope that helps, especially if you need the info for many recipes going forward (FYI, my new recipes will have nutritional info—I’m just unable to add it to every old one). Made these meatballs last night. I did not have all the ingredients and either omited (sage and onion powder) or substituted (fresh garlic and lingonberry preserve) and it still came out great. They’re very addictive. Can’t wait to make them again. I’m so happy to hear that you enjoyed these Uti. Thanks for letting me know! Erin, these meatballs sound so great! I’m hosting a ‘Christmas in July’ party on the weekend and was thinking I’d make these as burgers. Any suggestions for how they might turn out on the BBQ? Would I need to modify the recipe in any way? I excited to try them! Hi Holly, I’m sorry, but I have never tried grilling meatballs before! I’d suggest finding a different grilled turkey meatball recipe online, then following those cooking times. Because of the apple, these might cook a bit more quickly, so definitely keep an eye on them so that they don’t dry out. If you do decide to experiment and try them grilled, I’d love to hear how it turns out. Enjoy the party—that sounds so fun! These meatballs ARE fantastic!!! I didn’t make the cranberry sauce as I’m on a farm and not running to the store today (I also had to sub ground sage for fresh for the same reason) but will definitely make it in future. Both my kids (age 6 and 3) LOVED them! They were super easy and will make perfect lunches for school and harvest!!! Thanks so much!! Whoooooo hooooo! I am so happy to hear that Jen. Thank you! Do the meatballs freeze well? I was thinking of making them for a Christmas Party and want to get as much prep done ahead of time as possible. Thanks! Absolutely Lauren! I’d suggest omitting the sauce, then laying them out on a baking sheet, and freezing the sheet until the meatballs harden. Then, you can transfer the to a ziptop bag and store them in the freezer until ready to serve. Let thaw overnight in the refrigerator, then warm them up and add the sauce. I hope that helps and that you love the recipe. Awesome! Thank you, Erin. I can’t wait to try these. I’m sure that they’re going to be a huge hit! Thanks again! Do you think these would be good with ground chicken rather than turkey? Yes, Angelica! I’d check that your ground chicken is in the neighborhood of 93% lean like the turkey, but I think that’s a swap that would be delicious! This sounds perfect! I’ve been looking for alternatives to the traditional Thanksgiving meal, and I LOVE this idea. What do you think about just cooking them in a crock pot? Do you think that would work out well? If so, how long do you think it would take? I too would like to know if this can be done in a crockpot. And how?? Trying to think of something to bring to my boyfriends big family thanksgiving. Would love to make ahead and then plug in the crock at the party. Can you tell me how? Hi Lindsay! You can definitely make these meatballs ahead. Follow the recipe as directed, and then when they’re finished you can transfer everything to a slow cooker to keep them warm for the party. I hope you enjoy them! Have fun! My second thought is that you could cook the meatballs completely per the recipe and then keep them warm in the crock pot. That route would probably be the safest! Could I make this into a meatloaf and if so how long would you bake it for in a loaf pan? Hi Paige! I’ve never made this as meatloaf before, so you would be experimenting. I’d recommend referencing other turkey meatloaf cooking times online (the ones I saw were anywhere from 1 to 1.5 hours), but start checking it on the early side to make sure it doesn’t overbake. Good luck! Hi Erin, these look amazing! I plan on trying them out this weekend when my family comes over. If I do these as an appetizer, do you have any recommendations for a good follow up main course? Or, if not as an app, how would you suggest serving them for dinner? With spaghetti squash maybe? Hi Natasha! Serving these with spaghetti squash is a good idea! I also think couscous, rice, or this winter salad (http://www.wellplated.com/winter-salad-kale-pomegranate-recipe/) would be nice sides too. I hope you enjoy the recipe! Have a wonderful weekend with your family! just wondering how I could change these up a bit, with out the breadcrumbs so that they are gluten free, and also to serve cold – what would I do with the sauce? Hi Anna! I would actually serve these room temperature vs. cold, following the recipe as directed. As far as gluten-free, I’m afraid I can’t advise you there, as I haven’t tried the recipe this way. Do you have another gluten-free substitute that has worked for breadcrumbs in the past? You could certainly try experimenting with that here. Making your own homemade breadcrumbs with gluten-free bread could work well too! Great question, Fran! Regarding nutritional info, this is something that I’ve actually started adding to all of my new recipes, effective January 2016 (you’ll see it in the recipe box at the bottom). Unfortunately, it’s pretty time consuming, so I’m unable to go back and add it to past recipes. If you’d like the nutritional info for any of my older recipes (or really any other recipe or food), you can actually calculate it yourself for free at myfitnesspal.com (this is how I calculate the new recipes on my blog). I’m sorry I can’t give you the information for this specific one, but I hope that My Fitness Pal will be a helpful resource for you! Love this recipe. Made them tonight. Very light. What colors and flavors. Light, fluffy, earthy and tart. Went great with brown rice and butternut squash . Francesca, I’m so glad to hear you enjoyed these meatballs. Thank you so much for giving them a try and taking the time to leave this wonderful review! Chris, thank you so much for giving this recipe a try and taking the time to leave this wonderful review! I’m glad to hear the recipe turned out so well and was enjoyed by all! Hi there…I wanted to make these as an app to take to Thanksgiving this year. I was hoping to make these the night before and then just put them in the crockpot Thanksgiving day to warm and transport. Would you the meatballs and sauce separate until putting in the crockpot? Hi Amy, I don’t think there’d be any problem combining the meatballs and sauce the night before when you make them. I hope you enjoy the recipe! Hi Erin. Do you know the calorie count of this recipe per serving? and what is a serving? Hi Bonnie, I began calculating nutrition info for recipes beginning in January 2016. Unfortunately, it’s a time-consuming process, so I’m unable to go back and add it to previous recipes. If you’d like to calculate the calories, My Fitness Pal is a great resource (it’s what I use). The size of the serving is based on personal preference, so I listed approximately how many meatballs the recipe makes. I’m sorry I’m unable to provide specific information, but I hope My Fitness Pal is a helpful resource! Can you prep these meatballs in the morning and then cook them at dinner time? Love them! Hi Christine, I haven’t done that myself, but I think you could give it a try as long as they’re kept tightly covered in the fridge. If you do experiment, I’d love to hear how it goes. I looked thru the recipe and the comments and questions, but might have missed it somewhere, can u tell me how many meatballs you get out of 1 batch with the size of meatballs that you make ? I am definitely gonna be making these yummy looking meatballs ! Thank you ! ? Hi Wendy! The yield is at the very top of the recipe. 24 – 28 meatballs. I hope you enjoy it! Ive seen a few people asking about the nutritional information so here it is! I used a recipe calorie online tracker. This info is for one meatball of the 28. Thank you so much Emily! So helpful and appreciated!